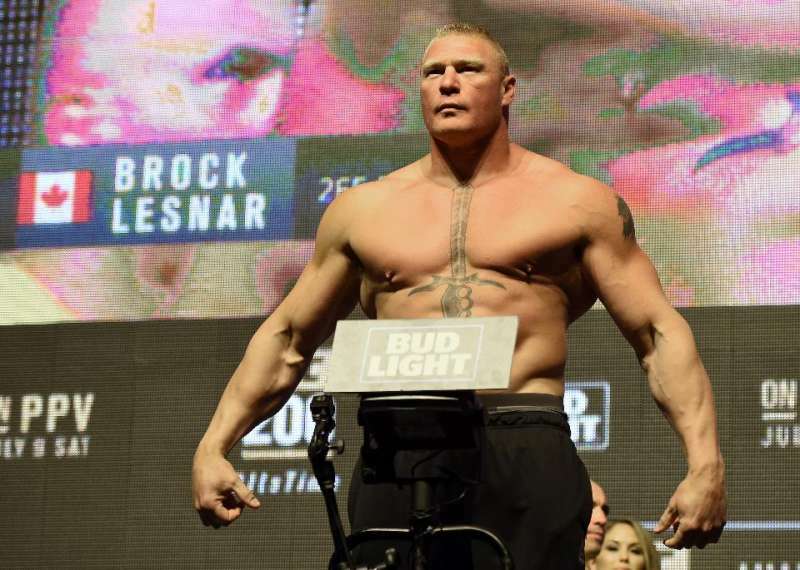 Brock Lesnar's workout: How does The Beast Incarnate maintain his physique? We are all aware that Brock Lesnar is a freak of nature. UFC colour commentator Joe Rogan has even gone on the record to say that Lesnar is simply “genetically superior”, with the context being Lesnar’s Wrestlemania XIX botched shooting star press directed at Kurt Angle, that could have nearly ended his life. However, being the freak athlete that he is, he not only continued the match, but finished it and stood tall to end his first Wrestlemania, with WWE Championship in his hand. Also read: Brock Lesnar’s MMA career – The highs, the lows and the controversies. Brock Lesnar grew up in a rural region of South Dakota, where he had no access to gym equipment for his physical training. However, through his experiences there, he learnt to be physically agile and utilised equipment in his farm in Webster to help improve his physique. He later took up football and ametuer wrestling and joined Bismarck State College, where he became a collegiate champion (NJCAA Heavyweight Champion) in his sophomore year. Brock Lesnar joined UFC in 2007. Despite the criticism he recived after his loss to Frank Mir, he went on to win UFC Heayweight Championship. He lost his title to Cain Valazquez, and a loss to Alistair Overeem made him quit the world of MMA. He made a senational return to MMA world in 2016, and defeated Mark Hunt at UFC 200. Even up to this day you can spot Brock Lesnar running down hill with a wood log on his shoulder. That is what fun is for the Beast Incarate.Considering this, wouldn’t it be interesting to know about Brock Lesnar’s workout techniques? Here is a clip of Brock Lesnar’s workout in his first run with the UFC several years ago. Just watching it will make you sweat! Brock Lesnar’s workout is so intense that he doesn’t need to watch his eating habits to lose weight. In fact, he works out so hard that he ensures his intake involves high Calories, high protein and 1 Gallon of water a day with electrolytes. However, the above-noted was for his MMA training. He did put on some more weight during his WWE run, but that does not mean he has been out of shape. His isolated home in Saskatchewan definitely allows him to pursue his intense workout without the interference or disturbance of too many people. Brock Lesnar earlier followed a cavemen diet, which consisted of high amounts of protein, the man is a big fan of hunting and ate what he killed. Though in 2009, he was diagnosed with diverticulitis, due to which he had to make serious change in his eating habits. He started eating more greens and reduced his intake of meat. This helped him to meet out his fibre intake, which was initially lacking in his diet. With a busy schedule, day in and day out, Brock Lesnar takes the help of supplement to meet his daily requirement. He religiously follow the idea of consuimg 30 g of high quallity protein right after his workout and training routines. Brock also uses creatine monohydrate to increase his endurance and drinks a minimum to 1 gallon of water with added electrolytes. Opinion: Is WWE willing to solve the Universal Championship Dilemma?